They say that home is where the heart is–if so, then a Witch’s home is her altar. That is where your most precious tools live: athame, god and goddess candles, incense, crystals … whatever you use to connect with the gods in your most private rituals. Your altar is where you go when you are most troubled and in need of help. It is where you go in your greatest moments of joy to give thanks. You stand at your altar to summon what you want and banish what you don’t, to ask for help and to ask for answers. What better definition of home could you have? So tend your altar carefully. Find items that you will treasure, and set them lovingly in their places. You don’t need a lot. One candle or six (god and goddess and the four quarters)-it’s your choice. That one perfect leaf, feather, or rock. As long as it means something to you, your altar is where it belongs. And your altar is where you belong, too. It is the one place where you can truly be you, with nothing hidden or held back. Laugh, cry, howl, or simply be silent… it’s all good. So go to your altar often, even if only for a minute or two at a time, and check in with yourself, the gods, and the universe. Ground back to the earth and to your truest self. And don’t forget to dust on occasion, either. Posted on November 18, 2015 by ladyoftheabyssPosted in Articles, Daily Posts, The Witch's ToolsTagged Altar, answers, Athame, Banish, Crystals, dust occasionally, give thanks, god and goddess candles, ground, home is where the heart is, Incense, joy, The Gods, truest self, Universe, Witch's home, your altar is where you belong. 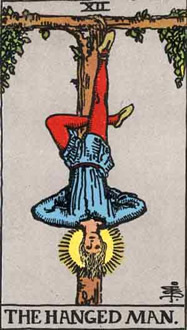 The Hanged Man is the most enigmatic card of the Tarot. Even Tarot giants like Waite, Crowley and Levi had trouble deciphering The Hanged Man’s true meaning. 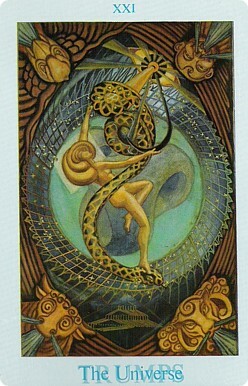 Generally The Hanged Man is thought to represent the value of surrender and selfless acts. The Hanged Man embodies the notion that sometimes to lose is to win. Unlike the aggressive Chariot, The Hanged Man creates his fate through inaction and accepts his fortune passively, without resistance. He does not struggle to control the path his life takes, but rather allows events to sweep him where they will, even if he is called upon to sacrifice himself. He is so at ease with the Fate the Universe chose for him that even hanging upside down from a tree does not ruffle his inner peace. Posted on November 10, 2015 by ladyoftheabyssPosted in Articles, Daily Posts, TarotTagged Chariot, Crowley, Daily Tarot Card, fate, Levi, Rider-Waite tarot deck, surrender, the hanged man, Universe. Like The Sun, The Universe brings good blessings. The Universe appears where all is in balance. It allows you to act effectively not only as an individual but as a member of a group too. The Universe promises contentment, fulfillment and completeness to those under its influence. It doesn’t guarantee there will not be moments of strife or discord in your life, but it does indicate that your trials and tribulations will be overcome; that ultimately you will know inner-peace and contentment. The Universe suggests you have found or will find your place in the scheme of things—that place where all is as it should be. Posted on July 23, 2015 by ladyoftheabyssPosted in Articles, Daily PostsTagged Crowley Thoth Tarot Card, The Universe, Universe. Posted on July 1, 2015 by ladyoftheabyssPosted in Articles, Daily PostsTagged Crowley Thoth Tarot Card, The Universe, Universe. Posted on June 24, 2015 by ladyoftheabyssPosted in Articles, Daily PostsTagged Crowley Thoth Tarot Card, The Universe, Universe. Posted on June 15, 2015 by ladyoftheabyssPosted in Articles, Daily PostsTagged Crowley Thoth Tarot Card, The Universe, Universe. send me some e-mail, and I will try to explain. easier it is to exercise control over it. Knowledge is power. The LAW OF SELF-KNOWLEDGE: An obvious derivative of the LAW OF KNOWLEDGE, this law carries additional connotations, as a mage who does not have knowledge of himself does not have knowledge (and therefore control) of his own magic. This law is one of the reason’s “evil” mages are very rare – a dedication to “evil for evil’s sake” is usually do to a lack of introspection and awareness of oneself. It is difficult to do harm to others when you understand fully what that kind of harm would do to you. Know thyself. over the variables is icing on the cake. time are likely to have more in common than the merely temporal. Very few events ever happen in isolation from other events. There is no such thing as a mere coincidence. The LAW OF ASSOCIATION: If any two pattern have elements in common, the patterns interact “through” those common elements, and control of one pattern facilitates control of the other(s) depending (among other factors) upon the number of common elements involved. This is a very important law, up there with the LAW OF KNOWLEDGE. doll) gives you power to effect the target. Look alikes are alike. intense and/or prolonged or repeated frequently. Magical power is contagious. identical with, the person’s true name. The LAW OF WORDS OF POWER: There exist certain words that are able to alter the internal and external realities of those uttering them, and the power may rest in the very sounds of the words as much as their meanings. Many of such words are names, though the meanings may have been lost or forgotten. Very many magical tools require words to be inscribed upon them and/or said over them during their construction and/or use. example, and thus find focusing their magic on the atmosphere much easier to do. inside of oneself during the communication process. outside oneself during the communication process. The LAW OF IDENTIFICATION: It is possible through maximum association between elements of oneself and those of another being to actually become that being, to the point of sharing it’s knowledge and wielding it’s power. This is the law that controls most lengthy or permanent possession phenomena. you can figure some out, you can use it. The LAW OF INFINITE UNIVERSES: The total number of universes into which all possible combinations of existing phenomena could be organized is infinite. fiction, but it also has a much wider application. but it does have some very useful applications. laws without screwing things up in your version of the real world. may not be a compromise, but may be something rather new indeed. especially healers, tend to live a long time. The LAW OF PERVERSITY: Sometimes known as Murphy’s Law. If anything can go wrong, it will, and in the most annoying manner possible. Magical associations sometimes operate in the reverse of what was desired, and meaningful coincidences are just as likely to be unpleasant as pleasant. Even if nothing can go wrong, some element of the universe may change so that things will go wrong anyway. Whether we like it or not, the gods (or fates, or what have you) do have a sense of humor. Emotionally healthy mages have less problems with this law than others do, as the mages own subconscious mind is probably a major perpetrator of this law. The LAW OF UNITY: Every phenomena in existence is linked directly or indirectly to every other one, past, present, or future. Perceived separations between phenomena are based on incomplete sensing and/or understanding. Posted on January 22, 2014 by ladyoftheabyssPosted in Articles, Daily Posts, Divination, Wicca, WitchcraftTagged Causality, Gestalt psychology, Happiness, Law, Law of contagion, Law of Magic, Personal computer, Universe. Let’s Talk Witch – Energy, It’s Everywhere! Energy is flowing all around us. Magick spells and rituals, when done with the proper concentration, allow us to harness that energy to attract what we desire. There are three main sources of energy in the Universe. It’s important to know what kinds of energy we are talking about when we start to cast spells. The first kind is personal energy. This is our own personal life force. We take in energy from the Sun, Water and food, and we release it through exercise, movement, and even as we exhale. The second type of energy is Earth energy. This is the energy from our planet. Each natural element has its own power which can be used in magick: Earth, trees, stones, wind, fire, and crystal are some examples of Earth energy. The third, most powerful type of energy is Divine power. This is the energy that makes up the entire Universe. This is higher power energy, life–whatever you want to call it. It’s the Universal power source, and it’s what we tap into when we perform magick. Posted on November 13, 2013 by ladyoftheabyssPosted in Articles, Daily PostsTagged Earth, earth energy, Energy, Magic, Magick, personal energy, sources of energy, Sun, Technology, Universe, water.